There's a million ways that a birth can go; we all know that. We all know that sometimes things just don't work quite as planned or sometimes we surrender into things that were not on the plan. And that's okay. The beauty of a birth plan is having the awareness to realize that things don't always play out perfectly. However if you are someone who has a certain vision for their birth or the process immediately following the birth, then perhaps this post can help you think of the different things that YOU want. Not the things that you think you need, what your doctor says you need or what your mother says you should do. This birth is all about you, your baby and even baby's father too. It should be a special moment to have a special day of memories and some of the most breathtaking moments of your life. 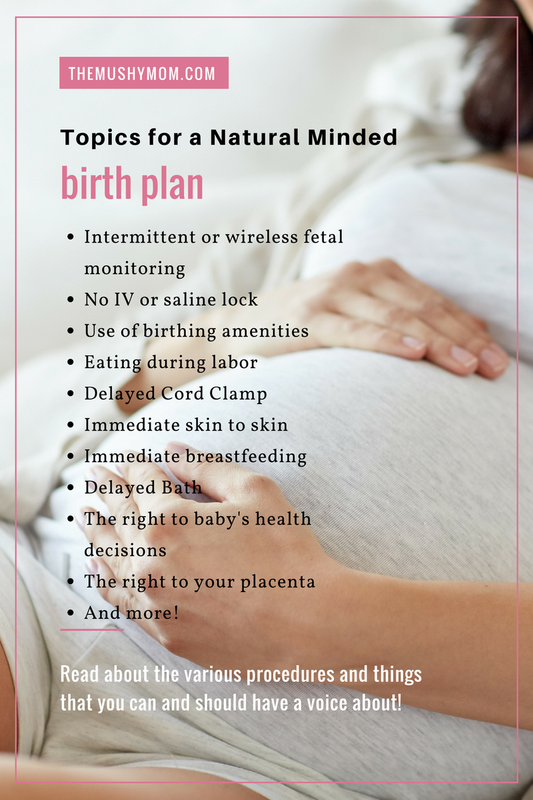 So what are some basics for a good natural minded birth plan? Keep in mind that this blog post is just a recommendation of some wonderful things to consider, but there are many others that you can even consider that are likely not mentioned here. Also, do not feel that to be "natural" you have to do ALL of these. Especially in the afterbirth process, you choose what you're comfortable with. No induction. Unless it is absolutely medically necessary and can be evidence based, don't get pressured into induction. Pitocin makes labor pains much more intense and very hard to handle naturally, so avoid induction at all costs. Don't buy into the pressure that baby is too big or that you're over your due date. Do some research on these topics if they begin to come up. Narcotics vs Epidural. If your goal was a drug free labor but unfortunately you're having a hard time handling the pain (hey, it happens! ), but you are hesitant to try an epidural - you can ask for narcotics first. Talk to your practitioner about this before the birth to have an idea of their typical protocol. The ability to move. For all of my labors I request wireless or intermittent monitoring. Some mothers don't want monitoring at all and only for brief checkups throughout the process (this is intermittent) and some moms like myself, enjoy the sound of baby's heartbeat the whole time. The only reason I choose monitoring is because my facility offers wireless monitoring that allows me to move freely, take warm baths and walk the hallways, etc... Typically a laboring mother finds the most comfort when she can move. No IV. Being trapped down to IV lines can be awful for a laboring mother as these can prevent the mother from moving as well. If you have to be stuck to one (I was with my first) it is actually easy for your coach or partner to wheel around as you walk around. However if you do not need one, ask to NOT have one or to have a saline lock put in place for emergency use. Hospitals will likely require the saline lock but midwives and birth centers are more prone to not use one at all. The right to eat. This is such a controversial subject sometimes. Quite honestly, I don't typically request food other than popsicles or something cool during my labors. However, it is your right to request food. More research lately is showing that food during labor is not as "taboo" as considered before and can really help the laboring mother gain her an extra dose of energy. Bring your own nut snacks, granola bars, fruit, etc... to snack on if you are unsure that your nurses will actually get food for you. Tubs and water relaxation. Getting into a warm bath is amazing. Unfortunately not all places may be equipped with a tub or blow up tub for a mother, so this may be something that you want to ask about in the beginning of your pregnancy. If they have it, use it; it's your right. Don't let a doctor or nurse stray you away from what can be truly relaxing. However be aware that sometimes a warm bath in the early stage of labor can possibly relax you enough to slow labor down, so you may be told to wait until around 5 cms dilated to get into the tub. Each situation can be so different sometimes when it comes to this. Use of other amenities. Your birthing room whether you're at a hospital or a birth center, should be equipped with a birthing stool, a birth ball, handles on the bed and even hand massagers. All sorts of goodies! Ask about these items and have your birth coach or partner remember to request them during labor just to try so you can determine what works. Delayed cord clamp. It has been widely known for some time that delaying the clamp of the umbilical cord does wonders for baby. Luckily this practice has finally been accepted by the American College of Obstetricians and Gynecologists. Straight from their website: "Delayed umbilical cord clamping appears to be beneficial for term and preterm infants. In term infants, delayed umbilical cord clamping increases hemoglobin levels at birth and improves iron stores in the first several months of life, which may have a favorable effect on developmental outcomes." Request that your doctor delays the cord clamp until the cord has stopped pulsating. Immediate skin to skin/breastfeeding. Request to have baby placed immediately skin to skin with you followed by the right to breastfeed soon whenever you are ready. I ALWAYS breastfeed before visitors come in, before bath, before they move me to my recovery room, etc... Once my baby is placed on my skin, baby doesn't leave. Most things that they "want" to do and check can be done while baby is still on you. Delayed bath. You may be thinking this is gross, but I promise it really isn't. The longer baby is coated in all of that gooey stuff, the better for their immunity and resistance. Basically that gooey stuff helps fight off germs. But don't worry, you can wipe baby up enough to look clean without actually bathing it off. It's up to you how long you choose to delay the bath. The right to your placenta. Want to eat your placenta? Or use it in capsules postpartum? Or perhaps have an artist make a placenta impression? Your placenta is yours. The right to a voice. Say no to things that you may be uncomfortable with such as pitocin for afterbirth, baby's shots, circumcision, baby's eye ointments, etc... Just make sure you have done your research to make these decisions based off of your own beliefs (and not others). Just because you want to be natural doesn't mean you have to say no to things that you may believe in, such as circumcision or the vitamin K shot. These topics are the most frequently requested topics in plans but still, not every millennial mama realizes she can have a VOICE on these. So many mamas fall victim to just following their doctors and nurses like zombies, that they don't realize until after that they could have said no. It's not that this is a bad thing, we obviously want to trust our practitioners. However we need to do what is in the best interest of us and our baby, and unfortunately even the best doctors in the world don't always do things in that way. And have acceptance for how your plan may or may not get altered. Birth is a natural and beautiful thing, so enjoy every moment of it. Here's to hoping you have the birth of your dreams.